"In early 1962, Stan Lee expressed the desire to do a teenage superhero using the spider motif. Jack Kirby had long wanted to do an insect-related superhero�With Lee�s input, Kirby began to craft an introductory tale, rejecting some of the more fantastic Lee story elements, grounding the character in a domestic situation featuring a kindly aunt and uncle, and giving the superhero a secret origin revolving around a neighbor who happened to be a scientist. 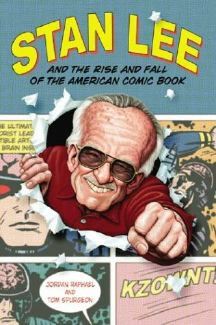 At Lee�s request, the character was turned over to Steve Ditko who, working from a synopsis and Kirby�s pages, produced an inspired visual take on the character that drove its story for decades�bottle-thick glasses, slumped shoulders, and a homemade costume." In short, many of the most memorable and human aspects of Spider-Man were actually contributions by Kirby and Ditko. In fact, the 'hybrid' nature of the Marvel comics of the early 1960s led to their most aesthetically distinct feature: Stan Lee's wisecracking dialogue floating over far more serious and, in some cases, even somber art. The tension successfully conveys something of the spirit of being a teenager, but I'm not sure a single 'auteur' could have captured it. "Something of the spirit?" We'd say that a wisecrack floating on top of a somber spirit is the very essence of a teenager. And it may have a lot to do with the success of Spiderman.